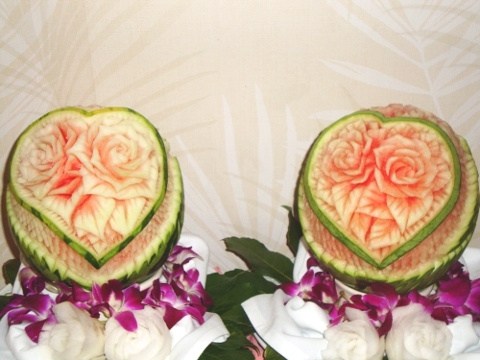 Welcome to the world of Fruit Carving. 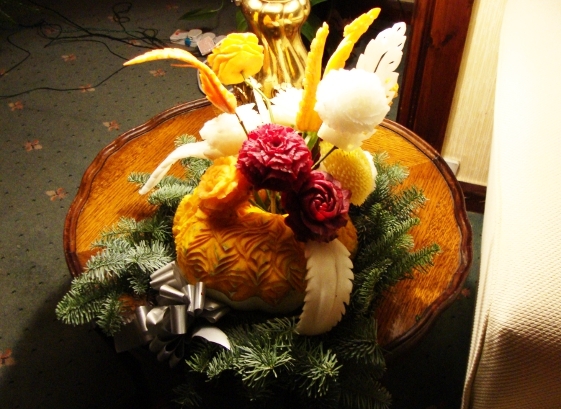 My name is Ead and I will help you learn how to create beautiful flower carvings from everyday fruit and vegetables. Create unique gifts for Valentines Day, Mothers Day, Birthdays, Weddings and any other special occasions you can think of. I will teach you how to transform dull inanimate fruit and vegetables into amazing life like flowers that will astonish and impress anyone who sees them. I have been Fruit Carving for many years. Having lived in Thailand most of my life I have had the opportunity to learn this unique skill which I would like to teach to you. All my lessons and courses are taught in the comfort of your own home and include all the vegetables and equipment you will need. If its a nice warm day I can even teach you outside in your own garden! I currently offer fruit carving lessons in Leeds and the surrounding area. If you would like to enquire about booking a lesson then feel free to contact me online. Take a look at some of the creations you will learn how to make below.